You’ve heard all press is good press—but how good? It depends how good you make it. Here’s an amazing example of how you can transform press into celebrity with effective, multi-channel marketing. And of course, this means revenue. Recently, Oracle hosted their annual user conference, Oracle OpenWorld. More than 40K attend this software technology conference, and many expect to hear each year from Marc Benioff, CEO and chairman of salesforce.com. But this year, Marc showed too much of his competitive side poking fun at Oracle’s CEO, Larry Ellison. Marc posted on Facebook that Larry’s Sunday keynote had set a low bar for Marc’s presentation. Larry’s reaction? Let’s just say it wasn’t great. Oracle not only canceled Marc’s Wednesday morning keynote at 3:30 pm the day before; it publicly returned his $1 million event sponsorship. Here’s where Marc’s genius emerged. Instead of getting mad, as many other CEOs would do, Marc stirred his team into action. The next morning at the very same time he was scheduled at Oracle, Marc gave his presentation one block away—but this time with a full press conference and a live video steam. In less than 24 hours, salesforce.com used social media and search to turn a bad situation into success that will likely generate revenue in the months to come. Of course, this keynote ousting would have produced epic PR with or without Marc’s brilliant response. Every major business news publication was discussing the CEO rivalry when I woke up Wednesday morning. But the PR team exponentially multiplied the incident’s value to salesforce.com. They issued a press release about the new off-site event and coordinated a press conference, pulling media personnel from OpenWorld itself. Think about your last trade show or live seminar. How many weeks or months did it take to plan? Now imagine if you were given less than 24 hours to put on a user conference. Serious props go out to a marketing team that can execute such an event. Nothing was overlooked—a live video stream to capture the mob-style gathering before the event, a press conference, and lunch. In one day, everything was planned. Keep in mind this is in the middle of one of San Francisco’s largest conferences when every hotel, restaurant, and bar has been reserved for months. And it went beyond the physical location. The salesforce.com team was ready with handouts and matching Salesforce garb. Event-specific signage and an entire on-site team drove buzz and awareness. Now off of Oracle’s turf, salesforce.com could stream a live video feed of Marc’s presentation on Facebook. Marc celebrated salesforce.com as a leader in cloud, CRM, technology, and innovation. Marc also explained the situation in a one-hour press conference that followed. But the final count is still going. Videos of both Marc’s presentation and the press conference are available on YouTube, and you can still find the latter on Facebook. Social media is how salesforce.com made everything happen. Marc tweeted about the offsite event. The news went viral via retweets, Facebook comments, and more within hours of the cancellation. 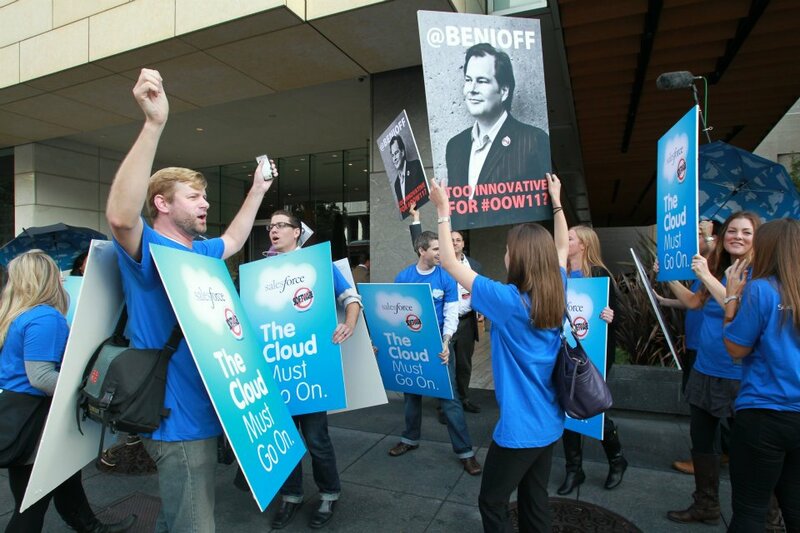 Photos – Immediately after the event, salesforce.com posted photos of the flash mob-style meet-up online. The photos appeared across all social media channels and likely drove additional views. Facebook – The team embedded the Salesforce Live! on Facebook, instead of hosting independently. As a result, salesforce.com’s many Facebook fans could easily view and share the event. Access was free and required no registration to eliminate barriers to entry. Chat – Inside Facebook, viewers could comment about the press conference or presentation. The chat functionality also captured ongoing Twitter conversations, so viewers saw others’ commentary while watching the live stream. Now we are getting to the part that really shocked me. I was impressed by how well the event logistics and PR were coordinated. 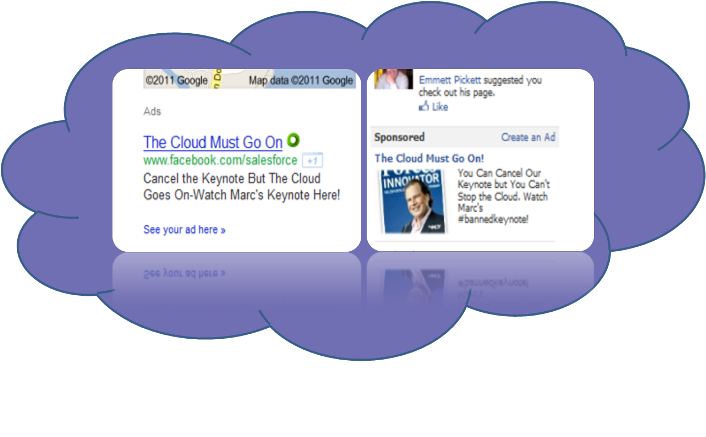 But I was blown away by salesforce.com’s social and search marketing. Shortly after the live streaming events concluded, I saw ads on Google and Facebook for the keynote and press conference. Anyone who searched for the news about OpenWorld or about the two CEOs’ ‘fight’ could end up watching two hours of salesforce.com’s presentations. I don’t think I’ve ever seen a multi-channel campaign executed so well in such a short amount of time. My hat goes off to the salesforce.com marketers. I hope you’ve caught up on your sleep—I’m sure you didn’t get any that night! Now it’s time to sit back and watch salesforce.com’s numbers soar.